Introduction and objectives Bronchiolitis Obliterans Syndrome (BOS) is the major cause of chronic graft dysfunction and contributes significantly to mortality following lung transplantation. There are few established therapies for BOS, thus identification of risk factors is crucial for prevention. Previous studies suggest Pseudomonas aeruginosa (PsA) colonisation reduces freedom from BOS, probably via neutrophilic infiltration and chemokine generation.1,2 Similarly, perivascular and late acute rejection also increase BOS risk. We postulate that Pseudomonas colonisation may influence acute rejection rates, subsequently impacting on BOS development. Methods We performed a retrospective analysis of 253 adult bilateral lung or heart-lung recipients at a tertiary cardiothoracic centre. Transplants took place between January 2004 and December 2013. Recipients are subdivided into three groups: de novo PsA (new colonisation post transplant), persistent PsA (pre-existing colonisation) and non colonisers. Data was collected on microbiology cultures, histopathology, serial lung function and survival. Results Survival outcome appears worse in the de novo PsA group though the difference did not reach significance. BOS rates are higher in the de novo group compared to persistent PsA group (SHR 2.22; 95% CI 1.02 to 4.80) following multivariate adjustment (Figure 1). The conditional risk set model was used to model multiple acute rejection events. Rejection rates are significantly higher in the de novo PsA group (HR 1.45; 95% CI 1.01 to 2.07) compared to non-colonisers. Conclusions This is the first study to examine the relationship between PsA colonisation and acute rejection. Whilst acute rejection may act independently to drive BOS development, a similar effect was not observed in the persistent PsA group. The interaction between Pseudomonas aeruginosa and the host immune system may be more complex than previously thought. These results will have implications on eradication therapy and surveillance biopsy protocols post transplant. Vos R, et al. Pseudomonal airway colonisation: risk factor for bronchiolitis obliterans syndrome after lung transplantation? Eur Respir J 2008;31(5):1037–45. Vos R, et al. Transient airway colonisation is associated with airway inflammation after lung transplantation. Am J Transplant 2007;7(5):1278–87. BOS rates analysed using the competing risks survival model. The cumulative incidence function for all three subgroups are shown following multivariate adjustment. 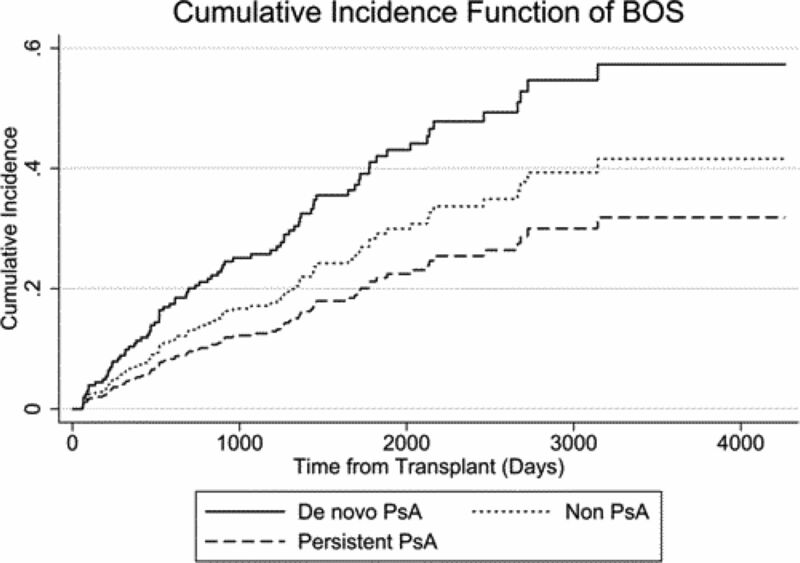 BOS rates are higher in de novo group compared to the persistent PsA group (pvalue 0.043).